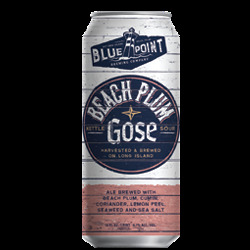 Beach Plum Gose is our Blue Point twist on a traditional German sour ale. We brew this kettle sour with beach plums indigenous to the shores of Long Island for a unique tartness and add North Atlantic seaweed and locally cultivated sea salt for a savory finish. This Gose stays true to its style’s German roots and its brewers’ Long Island roots - so it’s a little salty yet approachable, just like us.